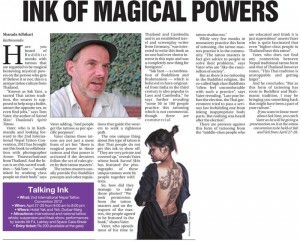 I have been interviewed about Sacred Skin, the first English language book on Thailand’s sacred tattoos, in The Himalayan Times, one of Nepal’s English language newspaper. I was in Nepal last week to attend the second international Nepal Tattoo Convention. To promote the book in Kathmandu, I also took part in a 30 minute discussion on tattoos on Kantipur Radio, gave three television interviews and made a well received presentation of Sacred Skin at the convention. Sacred Skin, co-authored with Aroon Thaewchatturat, is an international bestseller and has received some 25 reviews around the world. The book has also been subject of two television documentaries and will be presented later this year at the prestigious Ubud Writers and Readers Festival in Bali. Click on the image above for the story or follow this link.